What is this and how does it work? I’m not the first person to advocate for the use of the toast mechanism in Windows 10 and I’m most certainly not the last. Trevor Jones at https://smsagent.blog/ has again created something inspiring, as well as the guys behind https://automationsynd.github.io/. 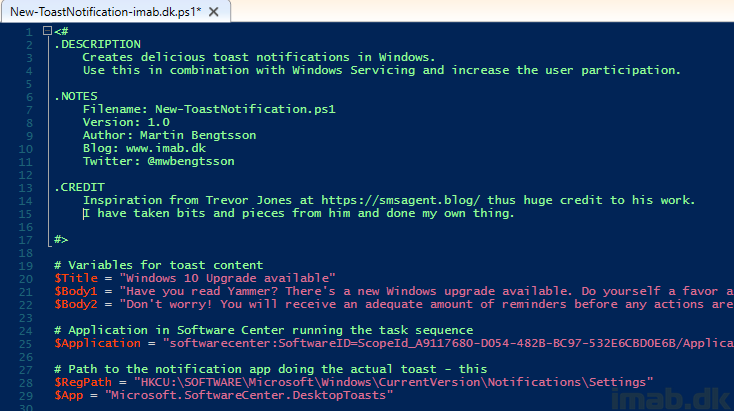 Both solutions involves using toast notifications in Windows 10 with SCCM. Needles to say, I also ended up feeling the urge and put something together which I’m using in my own WaaS setup. The effect of the toast is astonishing. I will elaborate later. This is the delicious magic. Download the script and open it with your favorite ISE and study it. I will elaborate where necessary in the next section. 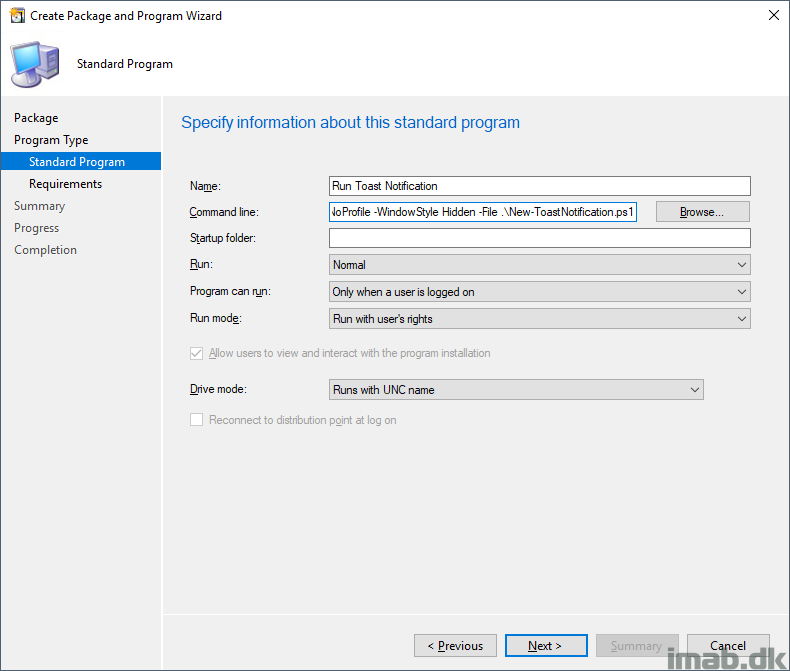 IMPORTANT NOTE: The script is tailored to a requirement of having the SCCM client installed. This is the entry in the registry around which app (Read: Software Center) that is doing the notification. If you don’t have the SCCM client installed, the toast won’t display! Alternatively, use something else. I have included an alternative app in the end of the script for uses on devices without a SCCM client. Simply running above script as is, will yield below result. So far so good. The text is obviously customized by myself and for my needs. 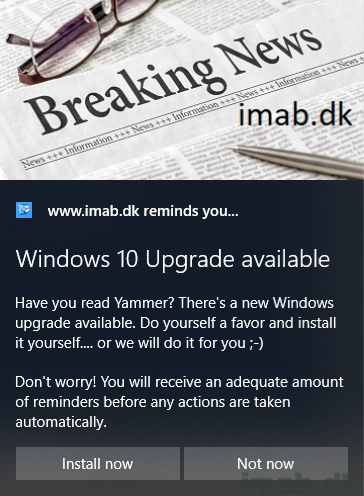 The reference to Yammer is for internal use. Note: Stating the obvious, I’m using Powershell App Deployment for recognizability AND some additional user-friendliness. # Application in Software Center running the task sequence $Application = "softwarecenter:SoftwareID=ScopeId_A9117680-D054-482B-BC97-532E6CBD0E6B/Application_4920c244-5b1e-4434-9117-fded57f5c80f"
Note: The image used here in my toast is 360*150 pixels. # Convert an image file to base64 string $File = "C:\Temp\News_imab.jpg" $Image = [System.Drawing.Image]::FromFile($File) $MemoryStream = New-Object System.IO.MemoryStream $Image.Save($MemoryStream, $Image.RawFormat) [System.Byte]$Bytes = $MemoryStream.ToArray() $Base64 = [System.Convert]::ToBase64String($Bytes) $Image.Dispose() $MemoryStream.Dispose() $Base64 | out-file "C:\Temp\News_imab.txt"
I’ve included some more options in the Powershell script in the very end: Deadline information and snooze action. 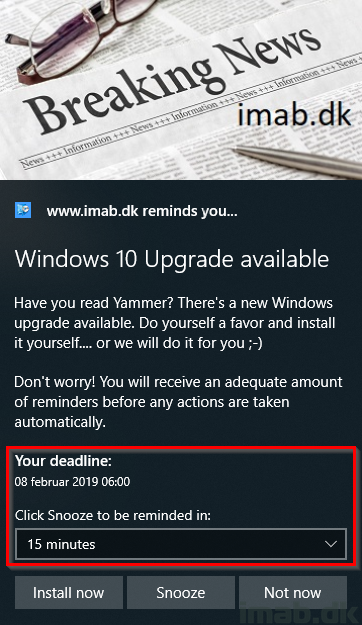 Deadline is obviously meant to be aligned with a required deployment in SCCM. The snooze option is self-explanatory, though not something I intent to use. If you enable these “features”, the toast will look similar to the example below. The toast notification is only relevant for computers/users who haven’t run the IPU already, but also computers where all of our Pre-Checks has passed and thus the same collection as we use for deploying the actual IPU TS. These numbers are astonishing. The deployment of the Windows upgrade is so far only made AVAILABLE and thus, all of these succeeded upgrades are due to voluntary user participation after 1 day. Now, this environment is still based on a mid-size company in Denmark, and I only manage 1000 (one thousand) devices roughly, but 18% user-participation is 18% – regardless of the size. To replace the image, what resolution does the image need to be? Just to save others time if they need the specific resolution, the hero image dimensions are 364×180 pixels at 100% scaling. we had to center our company logo and after playing around, we looked it up. What is stopping it from spamming the user with multiple notifications. If i just take the script and run it over and over again i get multiple notifications. So let’s say i leave the computer on over the weekend and when i come back i can have several of them? Or if a user just snooze for a week will it build up with one additional everyday? Hey Fredrik, only one toast will be active at a time, though if the first isn’t dismissed the subsequent will displayed immediately thereafter. This is due to the nature of the toast being a reminder and doesn’t dismiss itself. You can change that behavior changing this: toast scenario=”reminder” from reminder to long or short. Snooze functionality isn’t well suited for a reminder which requires the user to dismiss it. 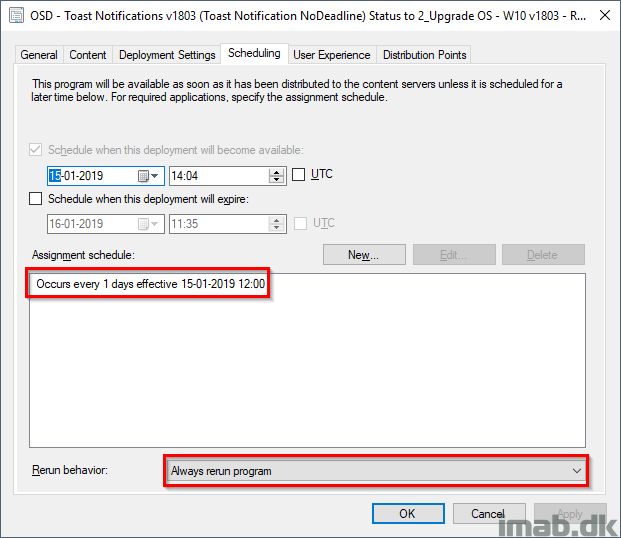 So you are right, if you run this on a schedule and none of them are dismisses because the computer is left on over the weekend, the user might find several reminders to be dismissed. You will have to work around that, if that’s a scenario you don’t want. wonderfully simple and elegant solution. Thank you! Something like this should have been baked into SCCM in the first place. I can run this with no problem locally (ps admin, exec policy unrestricted) so the script is fine after my tweaks… when putting it to package it does not. I can see blue ps screen flashing rapidly when timer hits. PS execution policy is set to bypass in Client Settings. Program can run only when user is logged. Hi, it does the same with your original version. 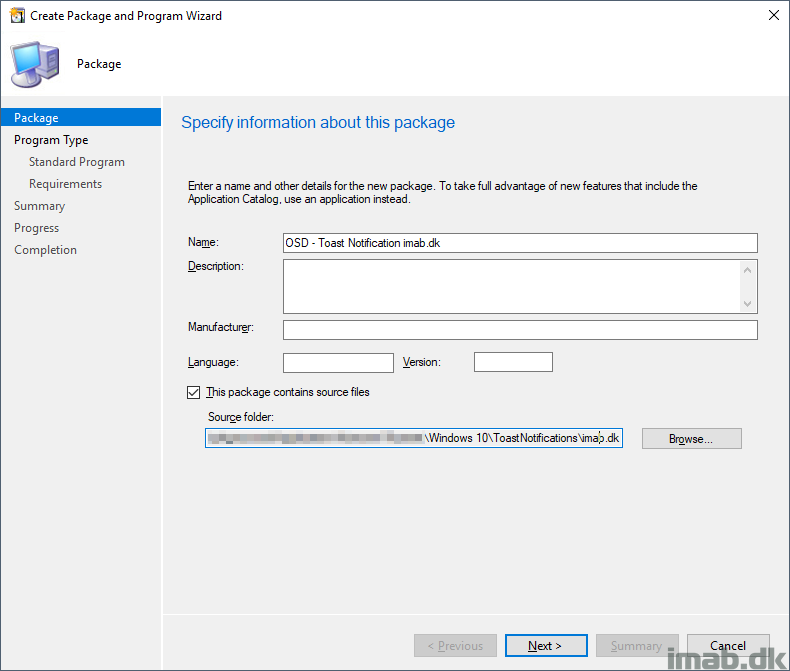 Could you show with more details how to do that package & deployment since the problem seems to be there most likely. Although it should’t be so trivial. But i’m obviously missing something. What in particular are you interested in to see? Have you tried messing around with the visibility? Hidden, normal etc. The flashing PS screen doesn’t sound right. The script is fire and forget and it’s Windows doing the toast. You might want to add some troubleshooting steps in there to see how much of the script is actually being executed. Thanks for excelent scriptv 🙂 I’m trying to use your script for reminder to enduser for installation of Office update (monthly channel users). When i run the script localy everything work great; the user get redirected to correct update in Software Center when clicking the ‘Install now’ in the toast message. 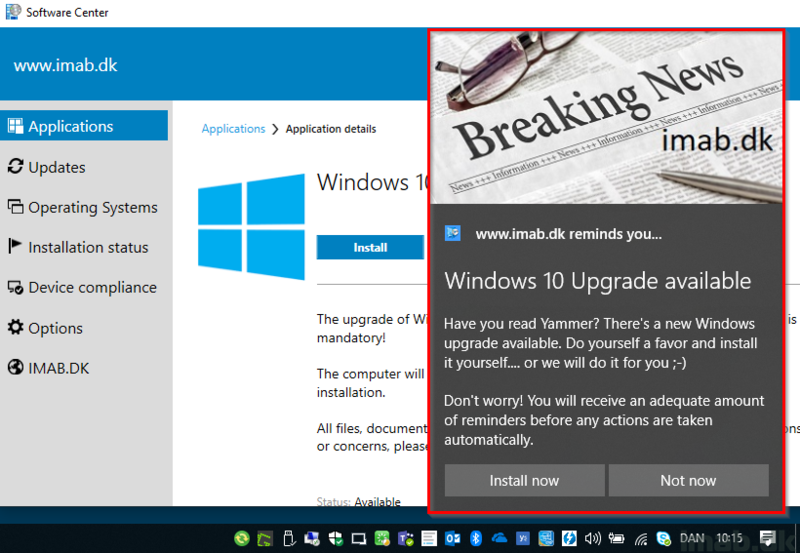 But when deploying it using SCCM nothing happens when user try to click ‘Install now’ in the notification toast. Any tips? Little issue I’ve run into that I’m hoping you fixed somewhere. How did you get past the Application showing as having failed immediately after it’s launched the TS to run the upgrade because the detection criteria for the app (the reg key UpgradeStatus being set to “0”) hasn’t been set at that point so the App thinks it’s failed. Have you thought about adjusting this script to handle Software Updates with Config Mgr? More specifically giving the user the option to choose the reboot time themselves within a deadline. The built-in notification system for reboot in the config mgr client needs improvement. I know that a lot of sysadmins who would love this feature. Thanks for this, really useful. One point, I had to remove .\ from the command line for the toast notification to pop up (so it now reads powershell.exe -ExecutionPolicy Bypass -NoLogo -NonInteractive -NoProfile -WindowStyle Hidden -File New-ToastNotification.ps1) Otherwise I was getting an empty PowerShell window appear for a moment and then the package failed. One question too, is there a way to add some intelligence to the toast script so that it will only run on 1703? 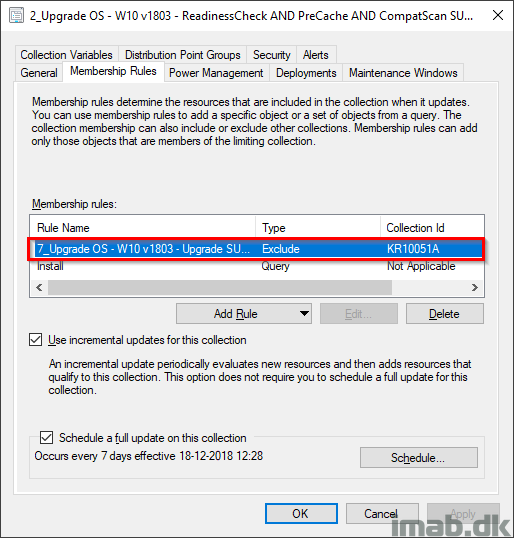 I have deployed to a user collection and it is showing up on computers that already have 1803. This is only possible with an application right? I’m not able to call a task sequence directly with this method? Thanks for this great tuto ! Thanks for all your work I will use it for the IPU Windows 10. I just have one problem when running the application to run the TS it says it installed en then it finished, it doesn’t start the actual task sequence. When starting this script manual then the actual TS will run. I have a problem with one thing that I cannot figure out. When I run this from sccm to a computer, it works when the user is local admin but not when the user don’t have admin rights. Is this by design and would it be possible to get this working for non admin user? VERBOSE: Check returned TRUE on ANY of the registry checks: Reboot is pending! VERBOSE: Check returned false on checking WMI for pending reboot: Reboot is not pending! New-Object : Cannot create type. Only core types are supported in this language mode.